Kleefeld on Comics: Is Steve Canyon A Turnip That Grew A Face? Last night, the S.O. 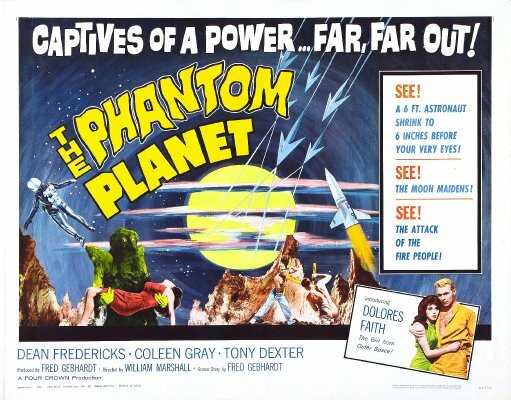 and I watched the Mystery Science Theater 3000 version of The Phantom Planet. What a deplorably paced train wreck of a movie! Not even a grade B flick; we're talking grade D-minus at best! Anyway, the movie's protagonist was played by one Dean Fredericks. He was kind of strange looking. (Tom Servo asked, "Is he a turnip that grew a face?") His hair was clearly bleached blonde but his facial features suggested a Native American or island heritage. The S.O. looked him up online. Although she didn't find anything about his heritage (that his given name was Frederick Foote and he frequently played an "Indian" in 1950s Westerns continue to suggest Native American, but there was nothing definitive) she was surprised to see this line in his Wikipedia entry... "an American actor best known for his portrayal of the comic strip character Steve Canyon in a 34-episode television series of the same name..."
Dean Fredericks was of Irish descent (believe it or not)...I have enjoyed PHANTOM PLANET since I was a kid, but my favorite line from MST3K's sendup of it is Crow's remark, "We're TERRIBLE astronauts!"...hehehe. ...and hey, thanks for the plug and links for our STEVE CANYON DVDs!